BELIZE CITY, Mon. Aug. 22, 2016–NEMO is advising residents of southern Belize, particularly those who reside in the Toledo and Stann Creek districts, to take extra precaution in light of a flood advisory which has been issued in response to a tropical wave that is passing over Belize. According to the Chief Meteorologist Dennis Gonguez, a tropical wave is passing through the country today, Monday, and is expected to pass by tomorrow, Tuesday. The tropical wave, he said, is not widespread, but localized in southern Belize. According to the statement, Jacintoville is currently under flood conditions, while Aguacate is inaccessible and water is 15 feet above the bridge. 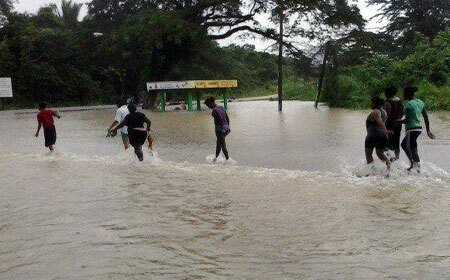 Other villages along the Moho River in the Toledo District and villages in the Stann Creek Districts are advised to monitor the flood situation. For assistance, Stann Creek residents can call NEMO Emergency Coordinator Victor Castillo at 630-9780. Castillo told Amandala that he is not sure how many inches of rain will fall, but if flood conditions worsen, those in low-lying areas can contact him to go to the community shelter. The NEMO Emergency Coordinator for the Toledo District is Kenton Parham, who can be reached at 630-9787. Parham told our newspaper that since last night, Sunday, the rain began and several roads in the Blue Creek and Aguacate villages have been cut off by water. e further revealed that water rose 4 feet over the Blue Creek Bridge. Those who may be unable to contact Castillo or Parham can contact the NEMO Emergency hotline at 936.